An Taillear Ruadh (the red-haired tailor) was Donald Montgomery from Leurbost. Explains the colour of my beard (when I had one and before it got ‘bleached’!). He was paid 1s 6d (8p) for a suit. Apparently is was 1s for the jacket and 6d for the trousers. He married Annie Murray of Atholl Cottage, Laxdale (later called Roanoke) and settled in 43 Newmarket Laxdale. Donald lived from 1824-1902 and Annie from 1830-1914. She had a wee shop and was wet-nurse to the children of the Provost of Stornoway. I have been unable to identify who was ‘Provost’ at this time? Their family was Allan, Alec (these two built the Carloway Bridges), Norman (my great grandfather)...who had a son John went abroad, inventor had an avenue called after him. This was John Murdo Montgomery, born 1877, but where he went and what he invented is unknown to me. A great grandson of Donald Montgomery, James Phair, had his own half a million pound factory in Florida for the manufacture of outdoor electric lighting. He was consultant for the lighting of Niagra Falls. Another of his great grandson’s was my Dad, a fact I mention purely because I am prone to get lost in the tangled web of my ancestry! Note: Thanks are due to my cousin Dorothy, for furnishing me with Mary’s notes, and to Donald (Dorothy’s brother), for giving me a whistle-stop tour of Lewis, but, most of all, to Mary herself. Allan John Montgomery was born on the 4th May 1856 and Alexander Montgomery on 3rd May 1858 to a Tailor, Donald Montgomery and his wife Ann (Murray) of Guershader Road, Stornoway. They were the 3rd and 4th offspring in a family that grew to a total of 9 children, all boys apart from the youngest who was born in 1872. Donald’s father and grandfather were Tailors in Luerbost, Lochs and that was were he was born. Ann was a Weaver’s daughter from Barvas Road, and latterly Laxdale, in Stornoway. Allan John, by 1881, was a Stone Mason (Journeyman) but at the time of the census was serving as a Private in the Highland Reserve Militia at Fort Ardersier, ‘On The Moray Firth’. Alexander, also a Mason, was visiting a family in Maryhill, Lanarkshire. By 1891, Allan John the Mason is living on the Barvas Road with his wife Margaret (Beaton) and their six children, aged from 1 to 11. Alex remains a Mason but has also built a family of four in Laxdale with his wife, Isabella. 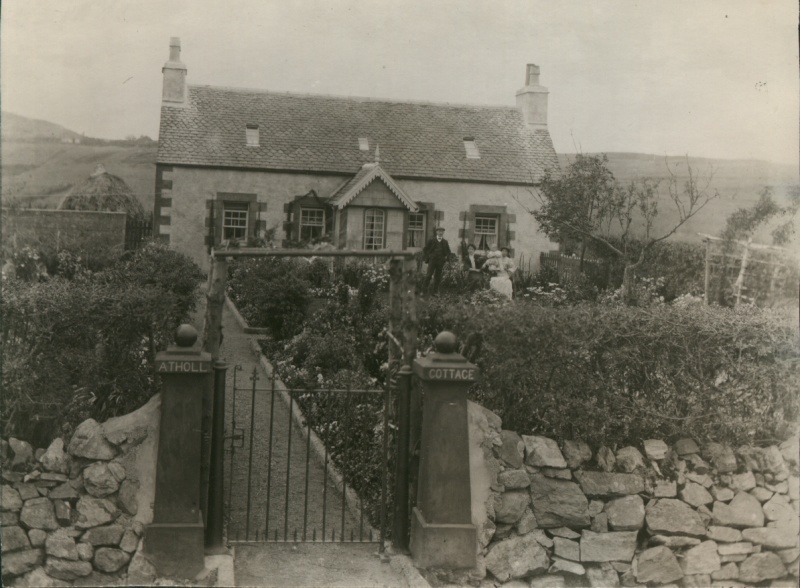 Our final glimpses of the Masons finds Allan and 7 of a family at 48 Barvas Road and Alex with his family of 6 at 14 Guershader in 1901. In between producing children they also produced the bridge. These two Masons were my grandfather’s uncles and my informants are my two cousins who are fellow descendants of their older brother, Norman Montgomery. This family portrait was taken by Mcleod’s of Stornoway. 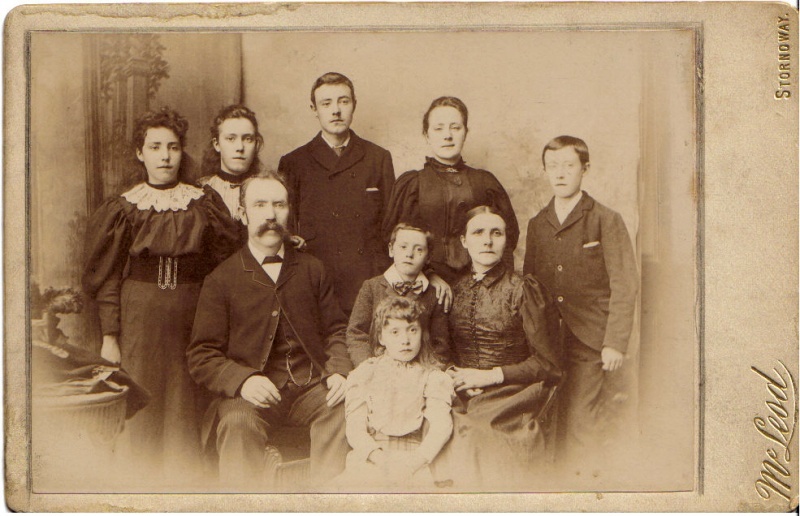 It is of the family of a tailor, Norman Montgomery (1853-1899), his wife Marion Maciver (1853-1951) and includes seven of their eight children. The youngest two, Johanna and Donald, were born in 1887 and 1889 respectively. I think this dates the photo to circa 1897, a couple of years before Norman’s early death in Glasgow. My interest in the photograph is that Norman Montgomery was my grandfather’s father. Norman married Marion Maciver on the 30th June 1875, my grandfather John Kerr having been born less than four months earlier on the 5th March 1875. On the 13th July of that year, the Sheriff’s Court in Stornoway ruled that Norman’s name be added to the records as the illegitimate John’s father. His mother, Annie Kerr, a dressmaker, went on to have seven more children after marrying her cousin William Maciver, a baker, on the 21st April 1881. They left 6 year-old John to be raised by his grandparents which was not unusual in cases where births out of wedlock were being concealed but seems somewhat strange given Annie’s pursing of Norman in the courts?